We have become tour guides after a long term experience abroad in different moments of our lives. Coming to South America represents a great challenge for many people. Through our service we have helped to demystify many of these fears by building a safe and most important; a joyful trip! A city full of joy is already waiting for you! Your trip will be customized in the sense of bringing Rio as you’d like to live it! Bending in with locals while experiencing the City’s Off the Beaten Paths is a challenge that you can leave on me! I attend solo travelers, families, groups of friends and trips with working purposes. Providing me your trip dates, a full trip planning will be customized for you. Just as the great majority of the Tour Guides in Rio de Janeiro, Brazil, I am a Free Lance licensed Tour Guide offering private tours with detailed information about the past and present Jewish life in Brazil while also visiting the most popular and famous sites and attractions of the city. As the largest country in South America, Brazil covers nearly half the continent. Much of it is made up of the Amazon Rainforest, allowing visitors to see spectacular sights like the Iguacu Falls, 275 separate waterfalls crashing simultaneously over a curved precipice. For animal lovers, the Pantanal hosts beautiful sunsets, wild caimans, toucans, enormous river otters, and so much more. It is a wildlife paradise the most extreme animal lover will find unforgettable. For those interested in Brazilian culture, history, and architectural beauty, Rio de Janeiro, Salvador, Sao Paulo, Ouro Preto, and Paraty are rich with friendly people, festive art, delicious restaurants, and history going back hundreds of years. Visit the Painted Favelas of Rio de Janeiro, the Paraty House built by Brazilian architect Marcio Kogan, and Ouro Preto’s early Baroque architecture, a UNESCO World Heritage site. More interested in lounging or playing on the beach? In Brazil you can also enjoy the relaxing Green Coast, the stunning beaches and blue waters of Florianópolis, or the Bahian Coast where many of Sao Paulo’s rich and famous go to relax. Surfing and other water sports are available. No matter where you choose to visit on your next tour of Brazil, enchantment awaits. From semi-arid climates to rain forests and gorgeous beaches, Brazil is a country of natural wonders. Dress appropriately because it can be hot and humid or dry and desert-like depending on your destination. On Private Guides, a personal tour is waiting for you. Let me introduce myself, my name is Marcelo Rocha, was born and still living in Iguassu Falls. In 2006 I graduated Bachelor of Tourism by the UDC, a local college. I am fluent in English, French, Spanish, Italian and Spanish I learned in a self-taught. Since childhood I always liked reading, insects, nature, birds, geology and cultures. In my teens I started to assemble a collection of insects. And I became interested more in Brazilian zoology, which some years later, was very helpful when I started working with tourists on a trail in the Iguaзu National Park. Whoever want to really get to know Rio, apart from the carnival or Copacabana beach, can experience: access to private art collections and invitation-only booths at Carnaval or dancing the samba in Rio's hottest clubs. You'll experience how nature and culture harmonize, making Rio a singular region. Professional Tour guide officially licensed by Senac-Embratur. Specialist in Iguaçu Falls, Both sides Brazil & Argentina, English-Spanish speaking guide, high knowledge about fauna & Flora. I was born and raised in Porto Alegre in the south of Brazil. After graduating in Business I moved to the US to continue my education. 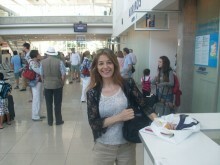 After 13 years abroad I moved back to Brazil and started to work in the Tourism Industry. Buzios - one day excursion at the most popular beach resort of Rio! Niteroi by Ferry Boat... a picturesque experience! 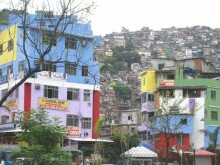 One day in Rio - "A Must do"
Santa Teresa & Downtown picturesque walking! According to the number of people. It depends on the numbers of customers. Paraguay. Across the river, another world! Depends on number of participants. Scrambling the Sugar Loaf mountain. Macuco Safari Boat Ride to the Falls. 30 min to 1 hour. All private tour guides in Brazil are legally required to carry a license issued by the Ministry of Tourism. Being unable to provide a valid license upon request usually results in a substantial fine and may lead to deportation for foreign citizens. In order to get a license the guide must be either a citizen of Brazil or have a permanent working visa. The licensing process starts with special courses, the solicitor must enroll in. These are official courses that last between 5 and 10 months depending on the state you're looking forward to getting your license in, and comprise training in various subjects, such as local culture, history, arts, cuisine, activities and landmarks among many other things. The learning center is responsible for training the future guides, testing them, registering all applicants with the Ministry of Tourism and helping them in getting the actual license. Completing the courses doesn't automatically imply that the guide will get a license, since he or she has to pass state exams as well. Licensed guides aren't rare in Brazil, but there are also a large number of unlicensed guides, especially in the most popular cities such as Rio de Janeiro. Despite to common belief, licensed guides in Brazil can actually cost less to hire and they usually have similar rates, unlike the wild guides who can simply rip off uninformed tourists.